Mississippi State University’s Crosby Arboretum has a new, high-tech way for visitors to experience the nature preserve. "My students always had their mobile phones in their hands," he said. "This new generation is very tuned in to instant communication. I thought maybe this new technology could be used as a learning tool. Building the application was an exercise for me too. I didn’t have an iPhone or any experience with this kind of thing." The application is to be used along the pond and south Savanna journeys. Each journey is a walking trail designed to teach visitors about different Mississippi habitats. There are nine stops along the adventure where visitors can get information and answer questions about the plants, animals and landmarks in each habitat. The stops include the drinking fountain, the pavilion, the oaks and wildlife sign, the briars and rabbits sign, the emergent cove, Tupelo Honey Landing, the pitcher bog, the longleaf pine walk and the Acolapissa sign. Brzuszek created the application to increase interest in the arboretum. "I think having this available will draw visitors to the arboretum who would not normally go," he said. "It’s also a way for families to do something fun together. I know when my family and I go places together, we like to have things to do. This application gives families a way to participate in an activity together while also learning something." 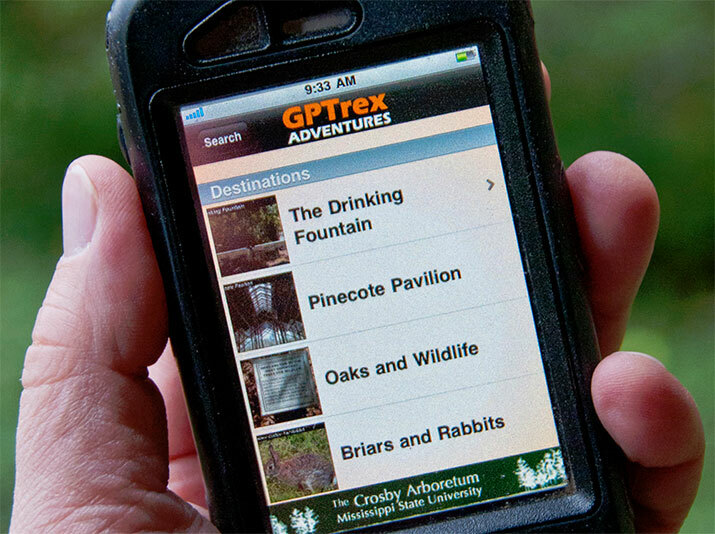 The application, which is a cross between a game and geocaching, has only been available since October 2011 and will be free to download from the GPTrex site through March 2012. The application is so new that it is too soon to gauge how popular it is among visitors. "We look forward to determining how successful this application will be," said Pat Drackett, Crosby Arboretum director. "We hope to engage visitors to try the app at our Heritage Festival on Nov. 18 and 19 as well as at some upcoming scheduled tours." Right now Brzuszek is hopeful that visitors to the arboretum will enjoy the application and learn a thing or two. "Part of my research is to see how people react to it, and I hope to learn more about this new technology myself," he said. "It’s a nice visual tool and creates a lot of opportunities for learning. In the old days when we wanted to know something, we went to a book. Books are still important, but we are much more multimedia oriented now. It’s easier and quicker to access information." Drackett hopes to bring more visitors to the arboretum by adding this technology. "What we wanted to do when we implemented this technology was to provide another way for visitors to explore the arboretum, and attract people who enjoy interfacing with the iPhone," Drackett said. The application can be used only with the iPhone, iPad, or iPod Touch at this time. Instructions for downloading and using the free application are available at the Crosby Arboretum gift shop. For more information on the Crosby Arboretum, see http://www.crosbyarboretum.msstate.edu or call (601) 799-2311. The arboretum is open Wednesday through Sunday from 9:00 a.m. to 5:00 p.m. in Picayune.